If we learn anything from “The Handmaid’s Tale,” season two, it’s this: Great television doesn’t need Aaron Sorkin-dense dialogue. In scene after scene of the Emmy-winning series, moments play without a word uttered. Instead, Elisabeth Moss’s face writes plenty, pulling us into the life of the handmaids and the cruel world that author Margaret Atwood has created. Here are the winners from last night’s Emmys. List of winners of the annual Emmy Awards, announced Sunday by the Academy of Television Arts & Sciences. Drama Series: "The Handmaid's Tale." Directing, Drama: Reed Morano, "The Handmaid's Tale." Actor, Drama Series: Sterling K. Brown, "This is Us." Actress, Drama Series: Elisabeth Moss, "The Handmaid's Tale." Supporting Actor, Drama Series: John Lithgow, "The Crown." 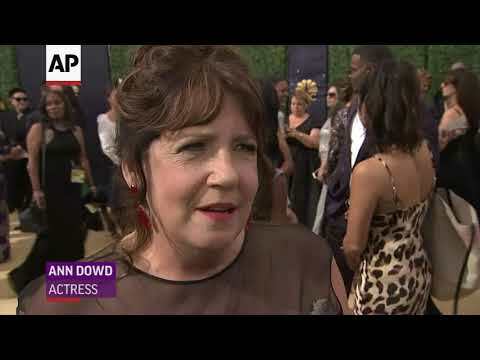 Supporting Actress, Drama Series: Ann Dowd, "The Handmaid's Tale."